Wonderful day at our Novice Trial at Fretwell Farm. Many thanks to Paul Drewery and Helen Fox for hosting this event on their grounds. To our Judges Mrs Theo Gould and Mr Howard Kirby for their time knowledge and fairness for judging through out the day. To our guns for aiming well and putting the birds on the floor and to all our competitors for being of good spirit, very sporting and fun company. Difficult day scent wise, but still we had some excellent dog work well done all. Guns Award CH Crumpsbrook Bayleaf Von Rulander (LM D ) Mr & Mrs K & W Lloyd & Smith. Many Congrats to all in the awards. Lovely day on our Novice Trial at Wispington, thank you to our Judges Ms S Allerton and Mr P Nixon for their time, knowledge and fairness in judging which was appreciated by all competitors. Thanks to Rory and Jane Major for being fantastic hosts and our sponsors the Guns and Working HPR dog food. Thank you also to Nicola Maddox for stepping in as Chief Steward much appreciated. A very enjoyable day, great atmosphere and only a little rain towards the end of the day. Thanks to all the competitors who have supported this event and congrats on wonderful sportsmanship all day. A super GWT today at Bucknell, many thanks to all who came and entered, helped and for the committee members who came helped also. A big Thank you to our judges for taking the time to come and judge. 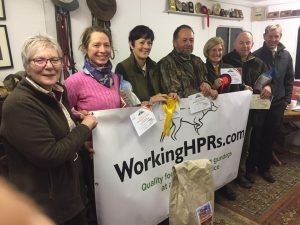 A massive thank you to Working HPRs dog food for their sponsorship and Our hosts Richard and Cindy Carlton. Results- firstly an apology to Paul Burdett as his puppy score was added up wrong and he should have been joint first……so sorry! Once again thank you to all who have supported Mark and myself and the HPRGA today and all the events we have run. Thanks to the Judges, Eddie Kania and Louise Holme, and to the keeper Andrew Chadwick. 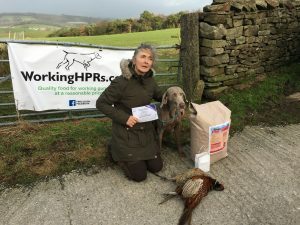 Many thanks to our sponsor Working HPRs dog food. Also many thanks to our judges.